The first NaNoCraftMo piece was actually done on Thursday, but I completely ran out of steam to upload it and write anything about it. 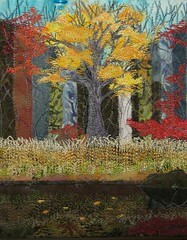 I am most pleased with the leaves on the trees, and how multiple layers of stitching and fabric give the idea of things in front of and behind. I am also delighted with the lumps of leaves - I was unsure when I stuck down the blobby fabric shapes how that would work, but stitching the edges made them blurrier and gave a better feel for the wispyness of the leaves.